The boy is given the name, Bakbakkar, by the mysterious Keeper of Names. Bakbakkar, the seeker, is raised by his uncle and aunt. Their son, Jared, becomes his best friend, but their sibling rivalry erupts in near death and betrayal. Bakbakkar is cast out. 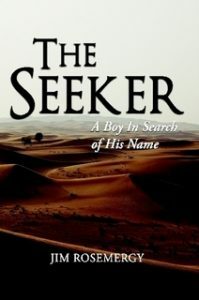 At the Riiver Jordan the boy receives his new name and discovers an ability he never knew he had. He is then faced with a choice. Does he return to the desert with his father, go to Jerusalem and become the son of the woman who supported him before his epic journey began, or return from exile to his aunt, uncle and cousin, Jared? Only a boy willing to fully embrace his new name can find his way home.